In what will be yet another boon for the new build solar market, Leeds-based G&H Sustainability has completed the solar project atop the North West Cambridge Development in the city’s outskirts, which is funded by the University of Cambridge. The project has seen nearly 1,500 panels installed across 12 buildings, with a total combined array capacity of 373kW. The systems are forecast to generate more than 298,000kWh of electricity each year. 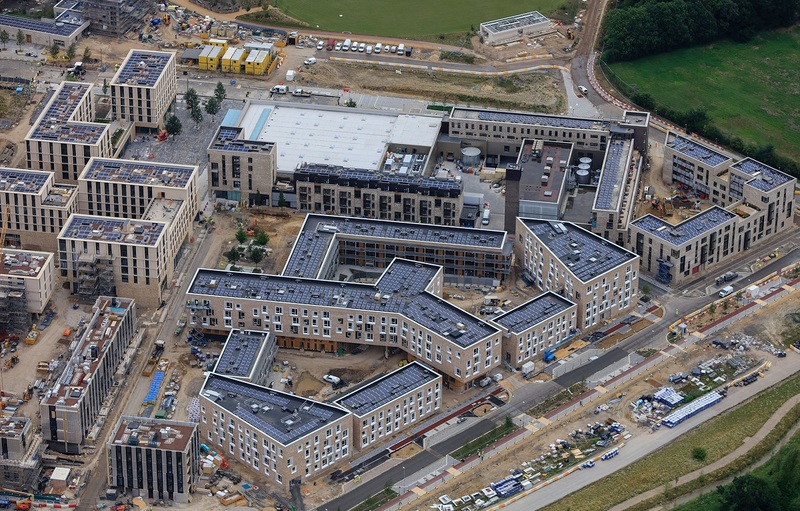 The North West Cambridge Development itself comprises around 1,500 affordable homes for university and college staff, a further 1,500 homes for private sale, accommodation for 2,000 graduates and academic and research areas. A university-funded primary school, health centre, supermarket, care home and sports facilities also comprise the development which has been named Eddington. It is located to the north west of Cambridge city centre, near the local villages of Girton and Coton. G&H Sustainability was appointed by Imtech Engineering on behalf of the main contractor BAM Construction to conduct the installations. Andrew Hudson, director at G&H Sustainability, lauded the university’s decision to seek BREEAM Excellent ratings across the development. “Solar PV plays a key part in this and any long-term energy reduction strategy. Solar is ideally suited to large roof top arrays, significantly reducing carbon footprints and energy bills. “We managed the entire process from design, supply and installation to complying with building and planning regulations,” Hudson said.